We no longer carry Hairmax Products. The first at-home FDA Cleared medical device to treat hair loss and promote hair growth in both men and women*. 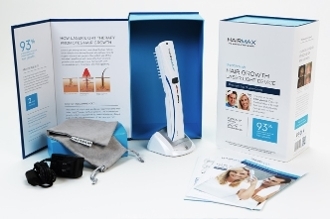 The HairMax Lux 9 LaserComb is clinically proven to Energize Hair Follicles, Stimulate Hair Growth, Reverse the Thinning Process, Increase Density & Fulness and Revitalize Damaged Hair. The HairMax LaserComb® delivers nourishing laser light energy that stimulates and enlivens hair follicles promoting new hair growth*. With consistent use, most users start seeing benefits in 12-16 weeks.